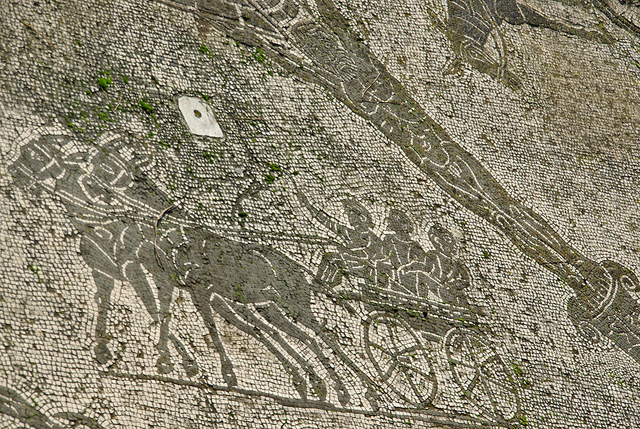 The Third Carriage Age: Why "Taxicab Subjects"
Mosaic of a Roman cisium in the Terme dei Cisiarii, Ostia. Creative Commons photo by Sebastiá Giralt. There are some subjects which may be written about even in a cisium. Cisia were the ancient Roman analogue to the modern taxicab: mule-drawn carts, hired from stands at the city gates, which provided transportation in the Roman suburbs (carriages were banned from the narrow, congested streets of the city center). Seneca wrote these words late in life, a retired statesman living in his villa on the outskirts of Rome. In a letter “On Business as the Enemy of Philosophy,” he detailed the mundane, everyday responsibilities and tasks which prevented him from enjoying the peace and seclusion necessary for the profound philosophical contemplation and writing with which he would rather have been occupied. Fortunately for the harried Seneca, some subjects (possibly this very letter) are simple or direct enough to be written about, even while being jostled along, from one appointment to another, in the back of a cab. 1. The history and development of urban hired vehicles. Despite the fascinating diversity of hired vehicles which have appeared at one time or another in urban history—waterborne gondolas and shikaras, litters and sedan chairs, rickshaws, horse-drawn and motorized cabs, pedicabs and motorcycle cabs—there is nothing inevitable about the emergence of vehicular traffic in cities. For most of urban history, such a mode of travel was rare or unknown. Until very recently, cities were built for pedestrian traffic primarily or exclusively. 2. Urban form and experience as these are impacted by travel in taxicabs and similar vehicles. Our cities today, of course, have been built around the automobile, or altered to acommodate its needs. Hired automobiles (taxicabs, jitneys, and motor liveries) played a crucial role at the outset of the automotive era, in habituating the riding public to the new, motorized experience. If the technology of “self-driving” cars is successfully developed, it is a fair bet that cities will once again be redesigned around that technology. Already, driverless taxis are being envisaged as an entry model to accustom the riding public of the future to the idea of self-driving vehicles. 3. Drivers and passengers. It is the writing, experiencing, and interacting taxicab subjects, in that other sense of the word (the subject as locus of subjectivity) which I am most interested in. In the dual sense (to paraphrase Althusser and Foucault): subject as the seat of awareness and origin of initiative, and subject as one who is subjected, controlled, or directed. Subjects, constrained and empowered as participants in the taxicab assemblage (composed of vehicles, persons, stories, cities, technologies, etc.). The idea that a cisium driver (cisiarius) might also write would probably not have occured to Seneca. Today, writing on “taxicab subjects” encompasses not only the back seat, and not only the front seat, but any writing in response to the varied subjects that pass through the cab, or that cabs pass through, and so are fit for cab writing. Who writes in the cab? What subjects does the cab, in its movement, inscribe? Encompassed in the practice of “in cisio scribere” are the harried office worker, completing letters or emails on the way to work, the cabdriving memoirist (in San Francisco alone, drivers have produced more than 11 book-length cabdriving memoirs over the last several decades), the passenger who writes about the experience of the ride (check out the eclectic backseat twitter comments collected by @myuberdriverbot), and the ethnographer writing down the words of the driver. My own research has focused on the changing relations between drivers and passengers, particularly as these are revealed in two historic conjunctures: the switch from horse-drawn to motorized cabs a century ago, and the present moment, in which the fascination with “driverless” vehicles reveals a great deal about contemporary sensibilities, whether or not the technology is ever succesfully rolled out. As they move through the city, cabs of any era have moved through a changing web of images and imagination; evolving ideologies of class, gender, race, labor, and technology; and shifting anxieties and celebrations of the kind of urban mobility which taxicabs, and similar vehicles, provide, and the varying subjects they provide it to.